If someone could ID what is on his uniform it would be greatly appreciated! The division patch is that of the 36th Division, a Texas-Oklahoma National Guard unit formed in late July - early August 1917 at Camp Bowie near Fort Worth. The insignia is an arrowhead pointed down with the letter T superimposed. The arrowhead represents Oklahoma and the T is for Texas. His collar brass (the round device with US on it) also shows the number 3. This is the 3rd Texas Infantry Regiment which was later renumbered as the 143rd US Infantry. This helps us identify the time frame of the photo since that change occurred in October 1917 when the 3rd and 5th Texas Infantry Regiments were combined to form the 143rd US. The distinctive unit insignia behind the collar brass is, probably, since I don’t have one handy, the insignia of the 3rd Texas Infantry although it could be an early insignia for the 143rd. It is certainly not the current insignia 143rd Infantry which was approved in 1926. The wreathed shield, barred, with a star surmounting is typical of Texas units of the time and even survives in the modern insignia of the 144th US Infantry which was formed in the 36th Division at the same time as the 143rd. See https://en.wikipedia.org/wiki/143rd_Infantry_Regiment_(United_States) for the current 143rd insignia and https://en.wikipedia.org/wiki/144th_Infantry_Regiment_(United_States) to compare with the insignia of the 144th. The qualification badges are, on the left “Expert” and on the right appears to be “Marksman” although the glare in the photo could be covering the detail that would make it a “Sharpshooter” badge; the difference being the marksman badge has a plain center to the cross, but the sharpshooter badge has a superimposed circular target. My bet, just because of the glare, is that it a Marksman qualification badge. 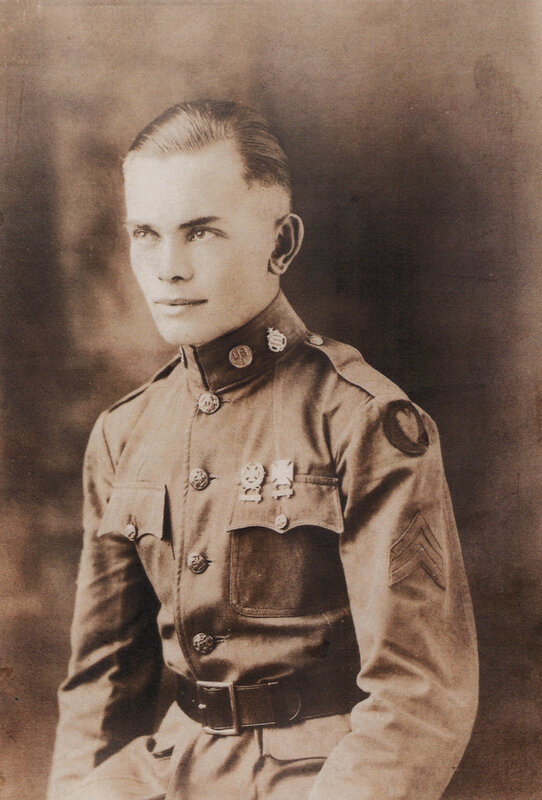 The rectangles below the badges would identify the weapon for which he earned the qualification badges, but the photo does not have enough detail for further identification. So, photo was probably taken sometime between the end of July and mid-October 1917.